Joseph Nicephore Niepce was born on March 7, 1765 in France. For the first time (in 1820s) he found a method of fixing an image, obtained in a dark-room. In 1829 he worked together with L. Daguerre. Nicephore Niepce was born in a rich family. His father was advisor to the king, and his mother was daughter of a famous lawyer. Niepce displayed his interest to inventive activity in his childhood, but he was preparing to a religious career; giving it up in 1792, he became army officer. 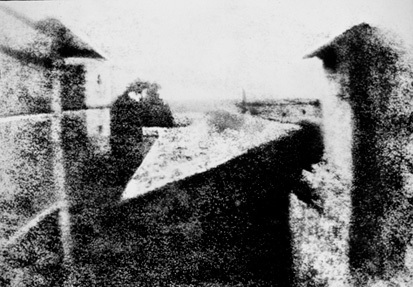 Niepce got the first stable image in a darkroom in 1822. However only heliography of 1826 remained, when Niepce began using tin-lead alloy instead of copper and zinc plates; the exposure lasted for 8 hours. In 1827 Niepce met Louis Daguerre, a rich and prosperous owner of the Paris diorama, who suggested him cooperating. And 64-year-old Niepce, sick and seeking for money for further researches, and in 1829 he signed a 10-year contract with Daguerre to improve the method of “fixation of nature images without the help of an artist”, invented by Niepce, and included a condition that his son will become a heir, if Niepce dies before the date of the contract expiration. Niepce sent to Daguerre a detailed description of his heliography process, and also demonstrated the technique of implementing processes, and Daguerre met with Niepce especially for this. Later they didn’t meet at all: each of them independently worked on the invention.